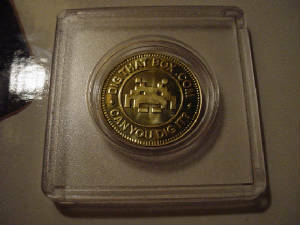 DigThatBox.com gives Leonard Nimoy a custom made Arcade Token! Earlier today we attended an exclusive press demo of a game called "Yoostar 2: Movie Karaoke." The game actually allows players to insert themselves into famous scenes from some of the biggest Hollywood movies. All you need is an Xbox 360 or a PlayStation 3 console and the Xbox Kinect or the PlayStation Eye. The technology in this game is quite impressive, and the game is actually really fun. This title is perfect for movie lovers, families, and social gatherings. Yoostar 2 promises to be one of the best party games ever made. We can alreadysee our friends acting in our favorite movie scenes. The title delivers a truly unique gaming experience. We honestly loved the demo and we can't wait for the game to arrive on store shelves. 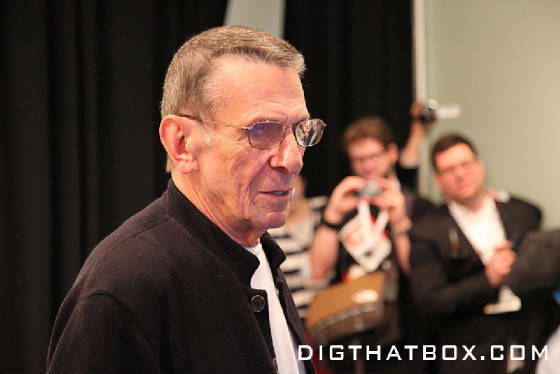 Now here is the best part... not only did we get to see an early preview of this fantastic new software but the demo was hosted by none other than TV & movie star Leonard Nimoy! Mr Nimoy was on hand to demonstrate this fun new title. 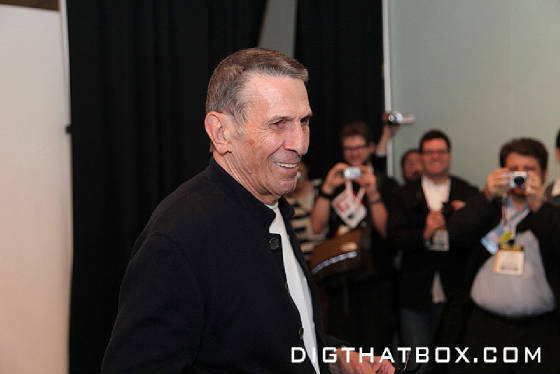 Having a legend like Mr Nimoy hosting the event was a great way to show off this highly unique game. We arrived early for the demo and patiently waited in line. As we waited Harald and I made a few new friends as we shared laughs and stories with our fellow members of the press, we had a great time. Finally after a long wait we were ushered into the private demo room. As we entered the small demo area we saw Mr Nimoy, he looked great. He was smiling and he seemed very happy to greet his adoring fans. Quickly the demo began and Mr Nimoy took his place in front of the camera. He even put on some cool sunglasses just to increase the dramatic effect. 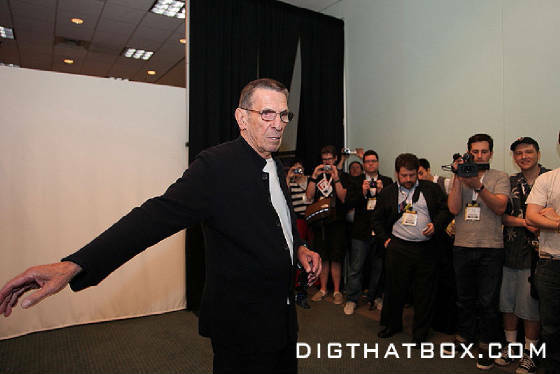 In this demo Mr Nimoy was re-enacting the famous "I'll be back" scene from the original Terminator film. What an amazing sight! It was incredible to hear Leonard Nimoy say the infamous "I'll be back" line. It was both hilarious and utterly surreal. Everyone in the room loved it. Mr Nimoy was inserted perfectly into the film. When it was over the audience cheered and laughed, it was a truly fantastic moment. 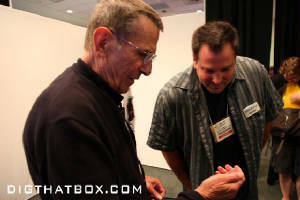 But it gets even better... when the event was over we presented Mr Nimoy with one of our custom Video Game Arcade Tokens! 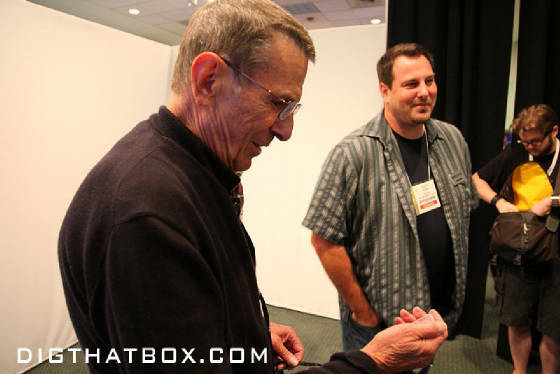 Mr Nimoy graciously accepted our gift. He was a true gentleman. And he really seemed to dig our groovy little E3 promo. 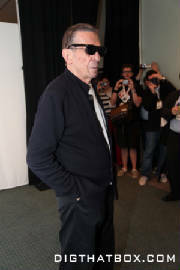 Who knew Leonard Nimoy was so hip? He really knows pop culture. As we stood for a moment I told him his work has had a tremendously positive impact upon my life. I also said "the two best shows in TV history are Star Trek and Gunsmoke and you were in them both." He laughed and smiled. It was a wonderful moment. It was truly one of the greatest days in the history of this web site. We would like to formally thank Mr Nimoy for being such a gentleman and for hosting this tremendous event. We would also like to thank the wonderful people who organized this amazingly fun demo. Yoostar 2 is a hit! And we can't wait to see more of this game when it arrives on store shelves.